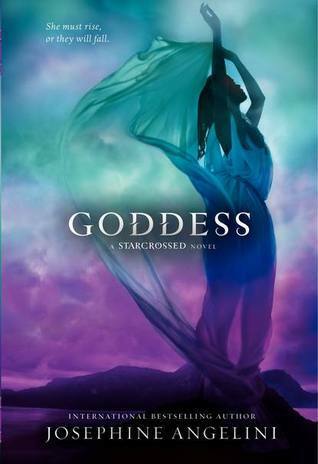 International bestselling author Josephine Angelini concludes her action-packed Starcrossed trilogy with Goddess—a romantically-charged page-turner that Newsday raved was a "clever reworking of Greek mythology." After Helen Hamilton accidentally unleashes the violent gods from their captivity on Olympus, she and her friends must imprison them before their thirst for war—and blood—take over the world. But the gods' fury already has a body count, and time is running out. With Lucas Delos's life hanging in the balance, and their once-solid group of friends now divided, Helen must face this battle alone, while also deciding who has her heart—Lucas, or the possible Tyrant, Orion. With a masterfully-woven plot and epically-high stakes, the compelling twists and turns in Goddess will leave readers completely spellbound. This book is such a perfect ending for this amazing trilogy. This trilogy itself has been an emotional rollercoaster ride. I fell in love with starcrossed, dissapointed in dreamless, and fell in love (but this time, harder) again with this book. I even think I love this book better than starcrossed. I get attached with the characters and I feel sad for them if I remember how things used to be between them in Starcrossed. I always love Greek mythology, and this book has everything that sums up Greek mythology: plot, scheming, backstabbing, starcrossed lovers, arrogant gods, and of course, tragedy. The story is beautifully written, it hooks me up right from the start and it made me almost stayed up all night to read this book. I cried and I cheered because of Hector. And, I freaking love the ending. No love triangle. Helucas, and Orion found his own girl. It almost provides happy endings for all the characters. Almost. If you love Greek mythology this trilogy is a must-read for all of you. For me personally, this trilogy will always on my favorite series list.